Home › Latest Promotions › Taste Freedom and Win! 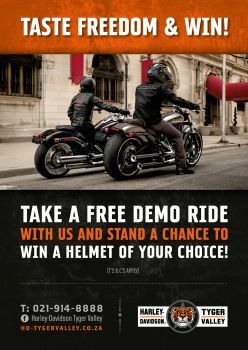 When you take a free demo ride with us during the month of September 2018, your name will be entered into a lucky draw to win a helmet of your choice! Book with our sales team (Chesco, Quintin or Kallie) on 0219148888 or click here.